Hip Hop and the World We Live In. Here's a banger for all the Fellowship/Project Blowed fans. 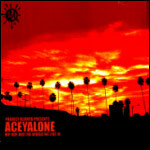 Acey comes tight with the master Elusive producing yet another West Coast classic. Re-issued by Decon in 2010. All tracks produced by Elusive. All songs written by Aceyalone. Executive produced by Aceyalone.